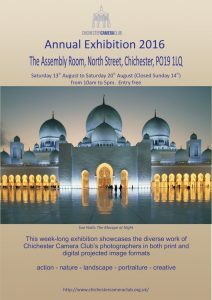 It’s just days now until the Annual Exhibition opens and the pre-exhibition meeting is this Thursday, 4th August at 7.30 at Tangmere. There’s been a tremendous amount of behind the scenes work going on to bring the exhibition together and a few matters are still outstanding which Members can help with. Please read the information below and help wherever you can. John Howes still needs help with the set up, and the take down on Saturday 20th. Members are also asked to come to the Assembly Room at 8.45 – 9pm on Friday 12th to help put up the exhibits. Donations are required for the raffle – please bring gifts this Thursday or on Friday 12th to Mem Baybars or Sarah Nichol. Members who have had awards or work mentioned in publications can bring items along for the news board at the exhibition. Please give these to Lorna Brown. And finally, there are still a few stewarding gaps – the rota will be at the Club this Thursday, please help fill in the spaces!